Supports Outlook versions; 2016, 2013, 2010, 2007, 2003, etc. PST splitter free tool is programmed with the concern of large Outlook Data File which usually becomes the cause of corruption and data loss in Microsoft Outlook. PST file splitter just minimizes this risk by reducing the size of PST file. 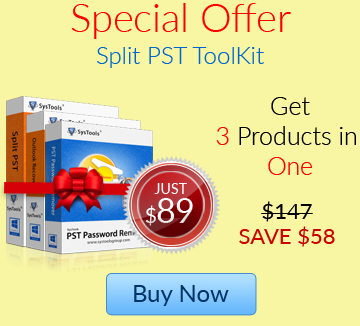 What Split PST Software can do? 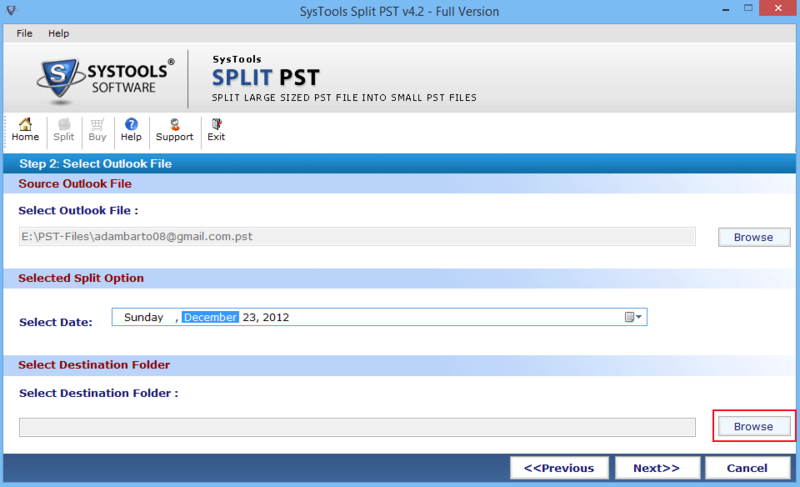 PST splitter tool permits you to break an Outlook file of any size. You can cut both; UNICODE as well as ANSI PST files without losing any data. Also, PST file splitter keeps formatting and Meta properties of each item within PST, intact. 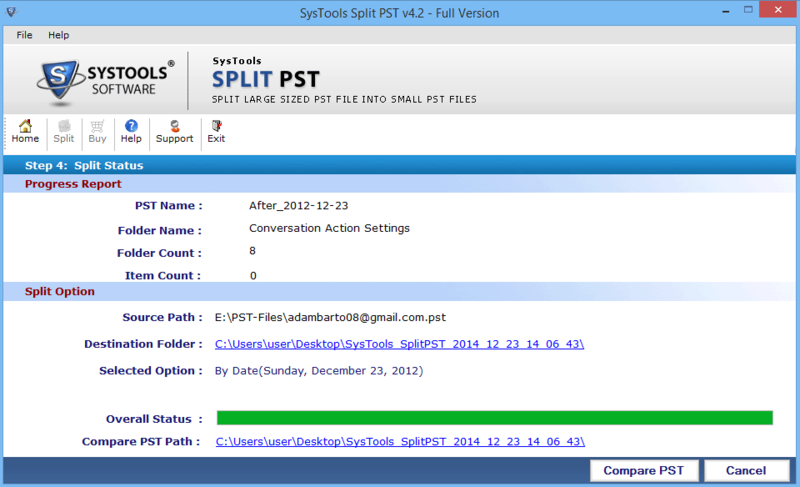 PST splitter tool allows to split oversized PST file by date. Here, you have to select a specific date and this software will break the PST file into two parts accordingly. The first part will contain data 'of and prior' to the specified date while, the second part will have 'data' after that date. Divide Outlook PST file by size option helps in easily breaking PST (personal folders) file into smaller segments using a defined size for all. You can assign a value to split PST file between 5 MB to 10 GB. And the PST file splitter will start splitting PST files into multiple parts according to the chosen value and reduce PST file size. To Break PST file by year select file by year option as it is helpful in breaking data yearly. The first section of file has content 'of and previous' to specified date. On other hand, other sections will have data 'Next' to specified date. You can also split Outlook PST file by current year 2015 & upcoming year 2016. 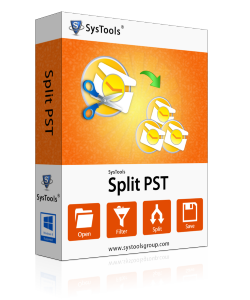 This option in PST splitter tool allows you to split each folder by size into multiple small PST files. It creates a single PST for each folder within the selected PST file and then divide respective folder by the size defined by you. The output files will be created as: Outbox.pst Outbox folder, Inbox.pst for inbox folder, and so on. 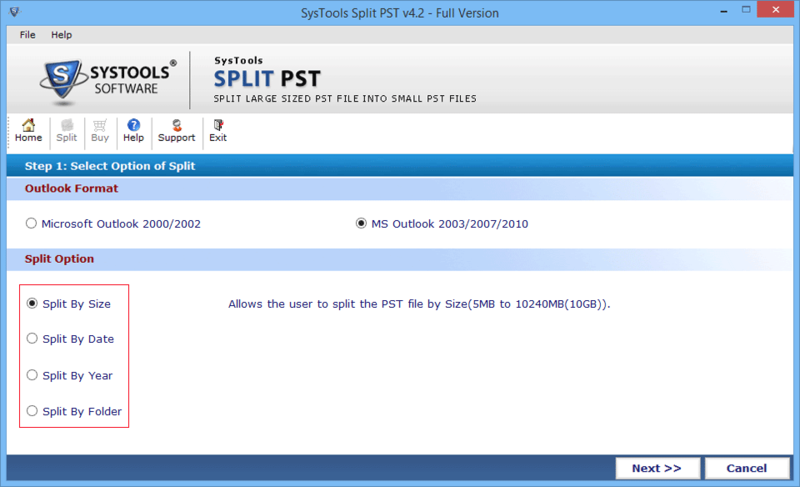 While selecting a splitting PST option, you also need to choose the MS Outlook version. 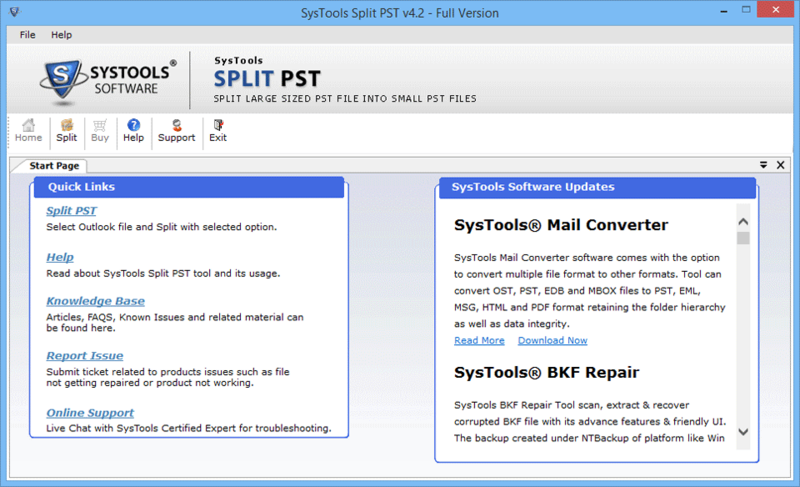 As this software is compatible with PST file types of all Outlook editions like; 2000, 2002, 2003, 2007, 2010 and 2013. Thus, even if you specify the Outlook version, software automatically identifies the format of PST. PST file splitter does not support PST files damaged due to over sizing issue. Although, it splits ANSI file format with size close to 2 GB. But, once the file crosses this 2 GB size limit and has become corrupt then you have to recover it first. After completion of splitting PST file process, the PST splitter tool free creates & allows to save the complete process report as CSV. This report carries details like; Name of Folder, Path of Folder, Number of items in each folder of the PST, difference and sum of items before and after splitting Outlook PST file. PST file splitter provides an option to save Outlook data file at the desired location, also if required then it allows to create new folder directly from software pane and restores file into it. Also CSV file will save at identical location by default. Is it possible to recover a corrupted PST file using this software? In order to deal with data of a damaged PST file, you need to make it flawless and this can carried out with PST file repair software. Once you repair the Outlook File, data will be broken easily. What does this mean: "Outlook is not Set as Default Email Client"? This error raised when you do not set the Outlook as default email client on your machine. Any idea, how much time PST splitter tool takes to split Outlook PST File? As less time as it can, but it depends upon the size of Outlook Data File that you are going to break. This software permits me to add or split multiple PST file at once? No,to split each PST file, you must run this software repeatedly and then only the division of PST file would have possible. PST file splitter has two installers (32bit & 64bit), which one should I choose? Check what bits of Outlook you are running and then choose the installers according to it. Should I have Outlook installed on machine to run free version of PST splitter tool? Yes, installation of Microsoft Outlook is needed if you wish to run free version of this software. I would like to say thank you to developers of PST splitter tool. This software did the job, which was almost impossible with default features of Outlook such as compact and archiving. I know that data becomes corrupted and prone to awry when the size of Outlook PST file grows. But, you can protect your data from being corrupted as Split PST software got me my data.